Blake is a WordPress theme based on popular Twitter Bootstrap framework. This All-In-One package includes the awesome Revolution Slider Plugin (18$ Value), Visual Composer Plugin, Ultimate Addons Plugin, unlimited customizability, built-in mega menu, full WooCommerce design integration, premium Cube Portfolio plugin, typographic options with over 600+ Google fonts, robust admin panel with hundreds of options to make it your own, tons of useful visual page builder elements and 15 pre-configured page layouts, available with just 1 click (really!!) installation. All the pages presented are just a simple example of what you can do with this multi-purpose theme. 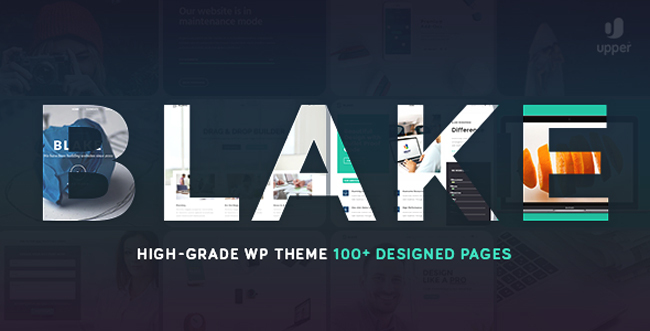 Blake come with a great collection of page builder modules, that you can use to build your new pages / sections. Blake comes with a lot of different loading styles that you can easily choose via admin panel. You can also change fonts, backgrounds, colors etc. You can disable / enable this website loading.